Do your writers need support developing a multi-paragraph essay? 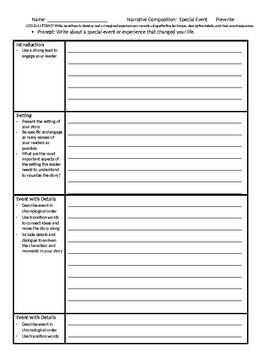 This highly scaffolded narrative writing template breaks down essay writing for your students into manageable pieces -giving first a prompt: "Write about an event or experience that changed your life", then directions for an introduction, setting the scene of your story, describing the event in detail, and concluding their writing. 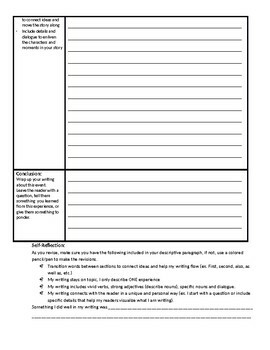 This one page, 2-sided writing template also has some self-reflection questions at the end. It is a great way to kick-off a writing project, and can be used class-wide, to accommodate those who most need writing support, along with students well on their way to becoming the next bestselling author. A great way to use this writing project would be to connect it to a book you are reading to students, or one they've read where a character has a life-changing experience. From reading about a character, students then go and write their own essay.